The Magnolia Mamas is a collaborative blog between Carrie Beth and Jen; two mom best friends with six children between them. A vision started over a poolside playdate has grown into something we both love and cherish. 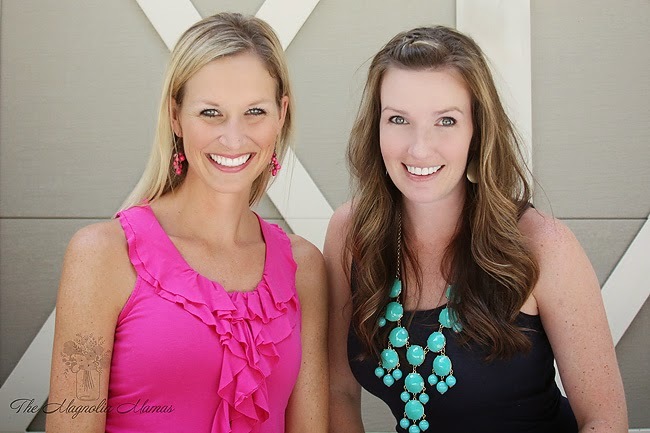 The Magnolia Mamas are also contributors for Savvy Sassy Moms and Twist Travel Magazine. They can also be found on various other media outlets as guest contributors with expertise in parenting, fashion, travel, and home decor. WHO ARE THE MAGNOLIA MAMAS? I am a twenty-nine year old (plus a few) mom of three. I am a photographer who a few years ago hung up her camera strap in an effort to concentrate on being a better mom and having a cleaner house (still waiting on that house part). I love reading, sports, traveling, trashy reality shows, all things sparkly, summer weather, buying the perfect gift, matching outfits, coconut, the color pink, and getting my workout on (see above carb addiction). I love creating and hosting parties. I love spending quality time with my husband in the midst of this chaotic thing we call everyday life, and I love my three little ones more than words will ever convey. Oh and I love wine. Mmm...wine. Well that pretty much sums up me. I am so excited to be on this adventure with my best friend and can't wait to meet you guys in the process!!! I'm a thirty-something mother of three. I just love all things southern including smocked clothes (although my littles have pretty much outgrown it), monograms, big bows, front porches and sweet tea. Hosting parties and filling our home with friends and family brings a smile to my face. I have fun being crafty, creating adorable appliqued items, giving hand-made gifts, and trying all sorts of DIY projects. My husband and I recently built and moved into what we hope will be our "forever" home! Making our house feel like a home is currently taking up a lot of my time and I'm having fun decorating room by room. Our family loves quality time together at the lake, and raising our children to be responsible, respectful, and gracious are incredibly important to me. Motherhood - including all of the ups, downs, and curve balls that go along with it - is my real passion and I am incredibly blessed to have 3 precious kids that make me a mama. This blog has been in the works (in our minds) for a long time and I'm super excited to finally be writing alongside my BFF, Jen. We hope you enjoy and can relate to the everyday life of a Magnolia Mama!